This supplemental information includes excerpts from Stephen Buhner’s book “Healing Lyme Disease Coinfections: Complementary and Holistic Treatments for Bartonella and Mycoplasma” and citations from Bill Rawls, MD. Addressing Lyme disease beyond superficial treatment requires an understanding of cytokine cascades and the likely interactions between the coinfections. 1) The endothelium must be protected. This is the lining of the interior surface of the blood vessels and lymphatic vessels. There are a number of substances that will protect the endothelia, but Japanese Knotweed Root (Polygonum cuspidatum) tincture is the most important. 2) The cytokine cascade must be interrupted. Cytokine pathways are used by bartonella and mycoplasma for survival. Cordyceps mushroom is used as the cytokine cascade reducer for mycoplasma infection. Japanese Knotweed Root addresses the cytokine cascade relating to bartonella infection. These may be taken together. 3) The red blood cells must be protected. Bartonella bacteria scavenge nutrients from red blood cells so the support and strengthening of the immune system to get the upper hand is critical. Ashwagandha and Rhodiola are two powerful plant tinctures used for boosting the immune system. The most important thing in treating coinfections is to reduce the inflammatory process the bacteria initiate, basically by counteracting the cytokine cascade they initiate. That stops pretty much all the symptoms right there especially if treatment protocols are also begun that are designed to protect the areas of the body that are affected. The bacteria can’t survive if they are not able to initiate their particular form of inflammation in the body; it is how they make habitat and scavenge food. Bartonella bacteria are gram negative (have a double cell wall), are slow growing, come in different shapes, and are very difficult to isolate in the lab. They can live inside cells lining blood vessels and in isolated locations in the body, protected from the immune system and antibiotics. Types of symptoms are related to the organs involved. Typical organs that can be affected include the liver, spleen, bone marrow, eyes, skin, and the entire vascular system including the heart. If the person’s immune system is healthy, the cells of the immune system quickly gain control. Bartonella is thought to occur as a coinfection in at least 25% of Lyme disease cases. Antibiotic resistant bartonella are common and because the microbes are slow growing, occur in low concentrations in the body, and concentrate in areas where antibiotics do not penetrate, non-responders are common. Many people who do respond relapse later. With regard to having a “herx reaction”(an overload of bacteria released into the blood stream for the immune system to handle), bartonella bacteria have a very low potential to cause Herxheimer reactions. The outer coat from dead bacteria is much less reactive than most other bacteria involved with Lyme disease. 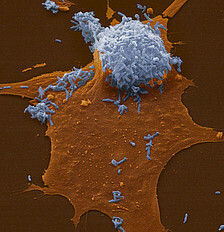 Bartonella bacterium does not form biofilms, but can form vacuoles that are similar in the liver. Generally vacuoles are broken down by the body when healing occurs.